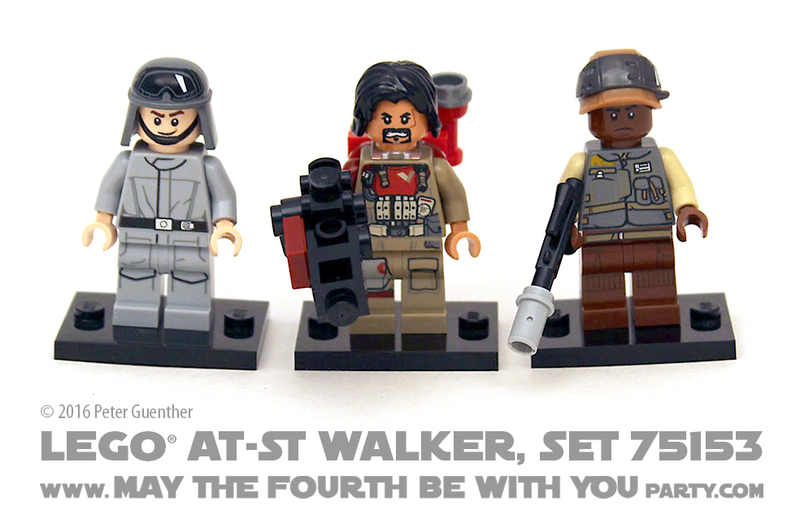 The set includes an AT-ST driver, Baze Malbus, and an unnamed Rebel trooper. The AT-ST driver is the most detailed we’ve had yet, with cloth wrinkles printed on front and back and goggles with a reflection printed on the helmet; his head is printed on both sides, one with a slight smile and one with a determined look. Malbus has a very detailed print and a backpack and weapon each built from multiple parts; he also has two face prints. The Rebel trooper has a new helmet, a new torso printed front and back, and one face print. 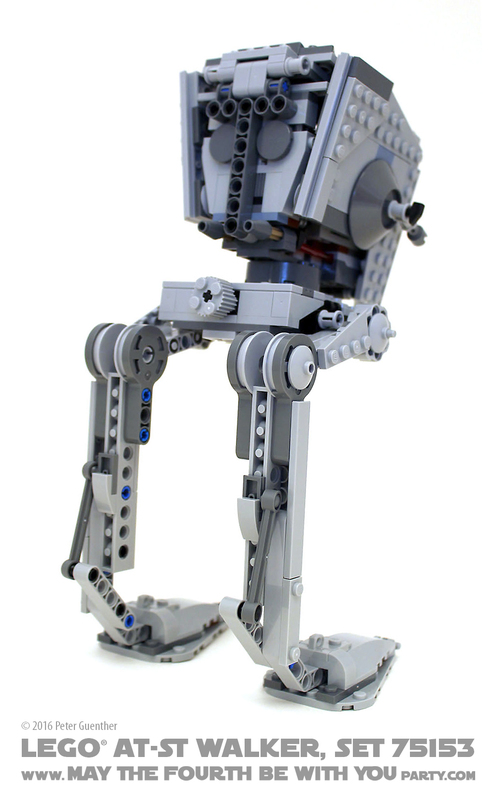 I was surprised to find as I wrote this article that while LEGO® has done several micro versions of the AT-ST and has done other walkers from the prequels and Rebels at minifig scale, they’ve only made 2 previous AT-ST sets at this scale over the years, the most recent in 2007. 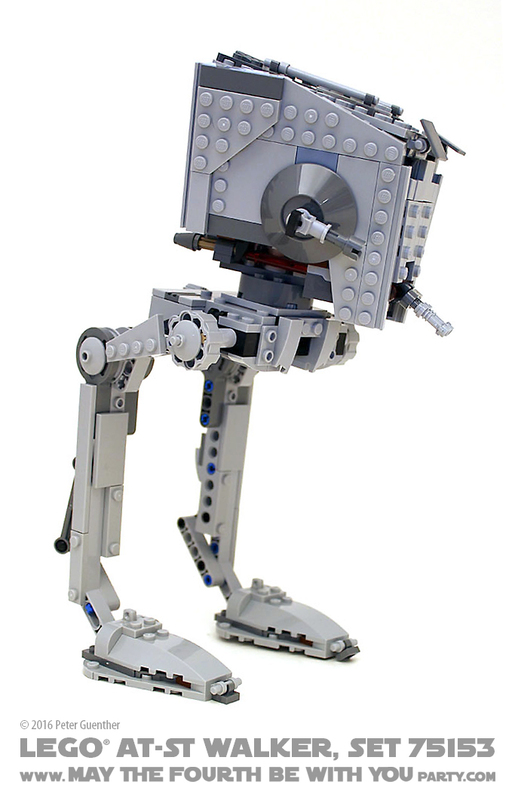 Some of those newer walkers employed different building techniques which this set takes to the next level, representing a huge leap forward from 2007’s straight-brick-walled version . The side walls of this AT-ST are built out of plates, securely fastened inside using Technic pins and other connectors. This set’s legs are fixed so that it stands solidly, but they are nicely modeled to give an appearance of articulation. The walker’s head can be rotated via a fluted 2×2 round on the back of the waist and the weapons on either side can be angled up and down. Not only does the top open, but in this set the hatch actually opens as a hatch, revealing a single seat for the driver and a printed thermal detonator tile. (An extra of any 1×1 round tile is always packed in a LEGO® set, so my picture shows a second, not officially part of the instructions.) Like most Star Wars sets these days, the AT-ST includes a pair of spring-loaded bolt launchers as well. Playability: While it makes a great-looking set to display, the lack of poseability in the legs may prove a disappointment to children; still, with two Rebels to take on this Imperial walker and spring-loaded shots to fire at them, this set offers good play possibilities. The top hatch is a nice touch. Challenge: With the angled sides and a lot of studs-out construction, this was an interesting set to build. It’s rated ages 8-14 because the build is more involved. Accuracy: I haven’t noticed any detailed shot of an AT-ST in the Rogue One trailers, but this set represented the chicken-walker we know from Episodes 5 and 6 very nicely. 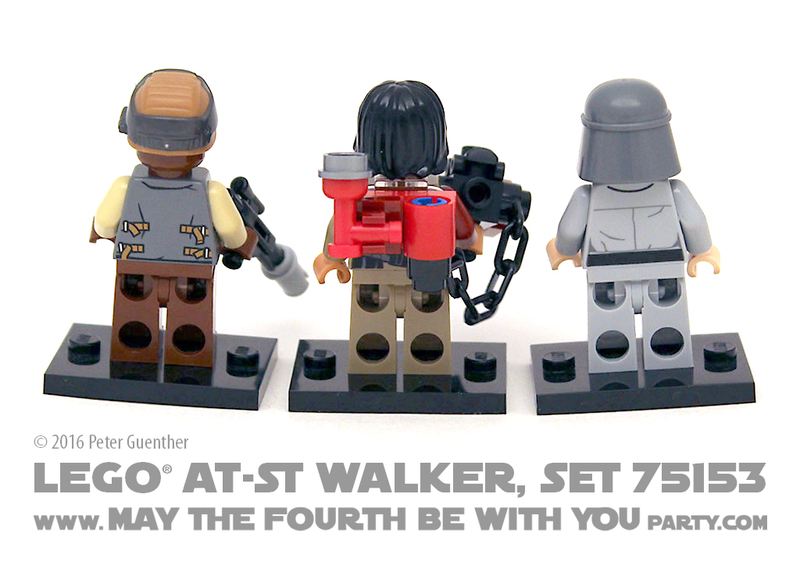 It’s definitely the most detailed AT-ST LEGO® has done short of the Ultimate Collector Series release. Value: The set beats the magic price point of 10 cents/piece that a lot of LEGO® collectors look for, so it’s a good value, especially with three new minifigs including a unique character from the movie. It’s a satisfying build and makes for a nice-sized display model.